Please help me welcome author Addison Fox to A Buckeye Girl Reads! She's here today talking about Swoon-worthy heroes and has a giveaway! Here newest book, Merger To Marriage, which released on May 13th. The giveaway is at the end of the post! My thanks to Colette for having me today! This is a great question because while I have favorites when I read, I can’t say I have a particular favorite when I write. Every hero I write is special to me and each sort of springs to my mind fully formed (or mostly formed!!) as the idea comes to me. I’m a very character-driven writer and my stories always come to me as characters first, with the plot and setting then wrapping around them. That said, I thought I’d write about what I love about each hero type. What makes them tick and what excites me about them as a romantic hero. ::Sigh:: Oh, oh, oh, the bad boy. What is it about these men that make us swoon with delight? The bad boy is a tough one to write because not only must you write a convincing hero, but you also need to show why – deep down inside – he’s worthy of our heroine. But when you do….wow, is the bad boy one of my absolute favorites. While I suppose the warrior is technically an occupation, I love a hero with a cause. Although they’re far more prevalent in paranormal romance, even outside of life-and-death-the-world-will-blow-up-in-three-days stakes you can find the warrior hero. He’s a man who wants to make the world a better place and believes it’s his responsibility to do that. Who wouldn’t love that? My heart might go pitter-patter over a bad boy but the moment a geeky hero takes charge on the page (especially in the love scenes) my heart just flips over. I love a character who is often underestimated but, instead, is simply biding his time to make a stand. When that stand is all about how much he loves the heroine….oh my, there’s not much better than that! The boy next door is a fun one to write. Who doesn’t love the town good guy – the one who everyone’s known since he’s in diapers. The one who can always be counted on to pitch in and help, no matter the circumstance. The one you think might be a bit too nice until you get to know him and realize there’s a tiger underneath. Wow, do I love it when that happens! Holt Turner, the hero of my latest release, MERGER TO MARRIAGE, is an alpha male. He’s determined to make something of himself (a.k.a. buying up and running the free world) and he’s quite pleased with his life. It’s only when Mayson McBride stumbles into his life, falling – literally – into his arms that he begins to realize his drive to succeed at all costs has been rather empty. What about you? What are some of your favorite heroes to read? What did you love about them? Addison Fox can't remember a time when words weren't a part of her life. An avid reader, she can be found with a book in her hand nearly every time she has a free moment. 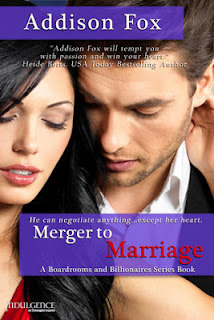 Her latest release, MERGER TO MARRIAGE, is the second in her "Boardrooms and Billionaires" trilogy for Entangled Indulgence. Three sisters at the helm of their family magazine empire. Three powerful men who love them. You can find Addison in various places and she loves to connect with readers!